Tshirt Laundry Free T-shirt Giveaway! So it has been a while since I’ve hosted a t-shirt contest at Loving This Tee, huh? Well I’m back with a new one for the next few weeks for all you funny t-shirt fans out there! Tshirt Laundry is one of the newer websites out there that carries funny t-shirts. If that happens to be one of your favorite tee genres besides artsy designs, then Tshirt Laundry is right up your alley! TShirt Laundry was kind enough to offer Loving This Tee not one… not two… not even three… but FIVE $25 gift vouchers to give away! 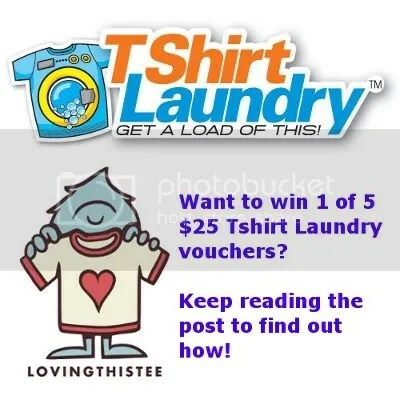 That’s right, five lucky Loving This Tee readers will get cash moneys to spend at the Tshirt Laundry shop. So how do you enter? It’s simple! 1. Head over to the Tshirt Laundry shop. 2. Come back to the comments of this post and link to your favorite design and tell me why you like it. Now that doesn’t sound too difficult, does it? This contest is open to everyone, and there is a limit of one entry per person. You have from now until 11:59pm Pacific Time on Friday, October 1 to enter. I’ll be doing a random draw shortly after and will announce the voucher winners on the following Monday. 35 Responses to "Tshirt Laundry Free T-shirt Giveaway!" My favorite shirt @ Tshirt Laundry is “Curiosity Killed The Cat”. i have 5 cats….. and their curiosity is very dangerous. i think that’s a cute one! Why? Cuz Ima cool kid. And I read comics. HELLZ YEAH! Because The Princess Bride is awesome, and so is this shirt. An actual original shirt. Hard to find nowadays and it’s actually funny! Retro all the way! This pun is a pun full of good, and probably made of right. This, me and my brother always joke about that clip in the Office, especially Jim’s ‘Quaddesk’ retort. It’s the funniest shirt on the site. This is so ridiculous. I would normally never wear anything like this but it somehow caught me by surprise. I love it. That’s a good one for an inappropriate tee party! I’m a huge nerd for portal and if i win i’ll wear this on my birthday (october 27th) while getting my portal tattoo! pure genius! who doesn’t need a recurring mental note of how hilarious the series of old spice commercials are?! this shirt’s a reminder of how creativity can refresh a product line in one clever ad! and how can anyone not want to wear “a man your man could smell like” on a shirt?! Have you seen the Swan Dive one too? It’s just so… cute? I think a little part of me is evil for liking it so much, but I really didn’t make the connection until the second time I saw it.. still cute. because I misread it and was like- SKOLITHOS!!?? on a T-shirt!? Yeah, I didn’t realize either because I thought it was cute but then I had a eureka moment and felt bad for thinking it was cute, haha. And skolithos on a shirt. Make that happen! So everyone will think my shirt just wasn’t finished in time! I like the humor and the style of this tee. because I am a big fan of Scott Pilgrim and I find it to be one of the more interesting graphics. I usually prefer shirts without text.